Function transformations are math operations that cause the shape of a function's graph to change. We will be discussing how these function shapes are related to equations, and how changes in those equations effect the shape of the functions. We are going to work with the shapes of functions as they are drawn on graph paper. We will use words like stretch, compress, and move to describe the function's shape change. A scaling is the stretching or compressing of a shape. A translation is the moving of a shape without distorting it. A rotation is the spinning of a shape about a point. Our list of transform types could also include a change in shape called a reflection. In this discussion we will cover reflections in the scaling section. If you watch the Scale section of the above animation you will notice that now and then the shape flips right or left, or up or down. These are actually reflections. Scalings and reflections both are governed by the same coefficient value within a function's equation, so we'll cover them together. We will not be covering rotations here. So, the transforms that we'll take a look at are scalings (including reflections) and translations. 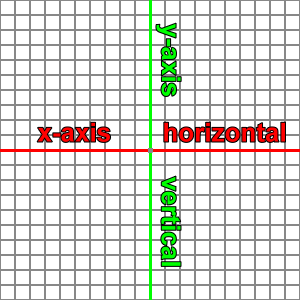 The word horizontal refers to an alignment or axis that extends to the left and to the right. The word vertical refers to an alignment or axis that extends up and down. Vertical scaling refers to a stretching of a shape along a vertical direction. grows or shrinks in both the upward and downward directions equally. grows or shrinks from the vertical center of the shape. The horizontal size of the shape does not change. As the above animation cycles, you can imagine that the function's shape is being stretched vertically. The shape is stretched upward above the x-axis, and the shape is stretched downward below the x-axis. However, you may imagine that the function is being compressed horizontally toward the center of the graph. This would be considered a horizontal scaling, as we will see in a later section. As it turns out, some vertical scalings are equivalent to horizontal scalings for certain types of functions, and this cubic is one such case. Note the little gray markers in the above animation. The ones on the x-axis do not move; however, their corresponding y-axis markers are stretched further and further apart upward or downward. Many of the y-axis markers are stretched far enough to be past the edge of the graph paper. Horizontal scaling refers to the stretching of a shape along a horizontal direction. grows or shrinks in both the leftward and rightward directions equally. grows or shrinks from the horizontal carter of the shape. The vertical size of the shape does not change. Vertical translation refers to a movement of a shape upward or downward. The horizontal position of the shape does not change. The vertical and horizontal size of the shape do not change. Horizontal translation refers to the movement of a shape to the left or to the right. The vertical position of the shape does not change. Since we often work on an (x, y) graph, and since the x-axis is usually represented horizontally, horizontal scaling and horizontal translations will also be called x-scaling and x-translations. The same goes for the y-axis in the vertical direction. Vertical scaling and vertical translation can also be termed y-scaling and y-translations.